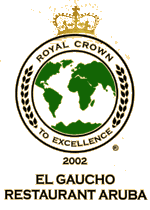 Mexico 2002 Royal Crown to Excellence This recognition was granted by the International Selection Committee of the Worldwide Marketing Organization in Mexico, for having achieved outstanding performance in quality of products and services, despite global economic downturn. Paris, France 2002 Golden Trophy for Quality Award of Excellence for 2004. Frankfurt, Germany 2001 Arch of Europe for Quality The international committee of B.I.D., Business Initiative Directions nominated El Gaucho Restaurant for the Golden Arc of Europe Award in the restaurant category. This prize was also received with great pride as the award is based on voting on the organization’s website by clients. Madrid, Spain 2001 International Award for Tourism, Hotel and Catering Industry. 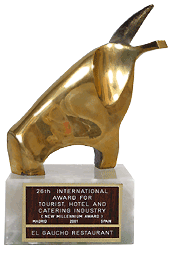 This award recognizes private businesses and official organizations working to improve the quality of tourism in their own countries.